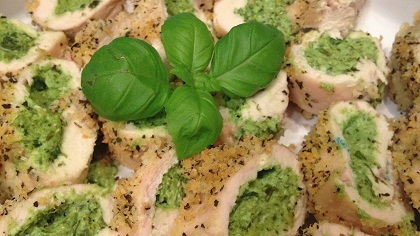 These chicken roulades offer a great option for a healthy meal. Your kids will love these veggie packed chicken roulades. Serve them with a side of steamed veggies and mashed potatoes for a healthy and complete meal. In a food processor, puree broccoli, spinach, cream cheese, and basil (or a handful of your favorite green herbs), to form the filling. Place heaping spoonful of filling inside each chicken cutlet. Carefully roll chicken keeping filling inside by 1/4" from edge. Place seam side down on a baking sheet and secure with toothpicks if needed. Brush chicken with olive oil. Mix remaining ingredients to form a crumb topping and generously spread over each chicken piece. Bake in 350 degree oven for 40 minutes or until chicken is cooked through. (May be sprayed with a bit of butter flavored non-stick spray if needed to add moistness). Let stand 5 minutes before slicing into 3/4" pieces.